There are certain types of food that I feel especially proficient at: Italian (pasta, pizza), Mexican (enchiladas, tacos, huevos rancheros), and, of course, American (baked mac and cheese, roast chicken, hamburgers). I can even do a little bit of Americanized Chinese (sweet and sour pork, oyster beef and brocolli). But there are some areas in the food world where I feel my skills fall short — or, at least, where I have little experience. 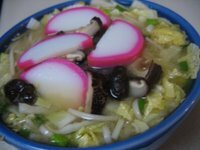 Using Seductions of Rice as a guide, I recently attempted to make a bowl of udon soup. Actually, all I had to work with was a recipe for dashi, a broth made from kombu and bonito flakes. And I didn't have any bonito, having no Japanese markets nearby (which is one of the things I greatly dislike about living in Santa Cruz — no Asian grocery stores!). So I made a variation of dashi, using kombu and dried shiitake mushrooms. My local natural foods place sells kombu in bulk, and this was the first time I'd used it. Unlike mild, sweet nori, kombu smells just like the seaweed that washes up on the beach and lies around in the sand: kind of stinky. I didn't let that stop me, though, and even later used the briefly-boiled kombu to make a black kombu relish, which I have yet to try. Once the dashi was ready, I realized I had no idea what to do next to make my dream of udon a reality. I have cookbooks for all sorts of foods — West African, Filipino, Vietnamese, Chinese, and, of course, the usual tomes of "everything" the author assumes you'd want to cook (How to Cook Everything, for example) — and while I've learned a lot from the Food Network, the shows typically showcase foods that are European or Euro-American. I'm pretty much in the dark when it comes to Japanese cooking. So I did what any hungry cook worth her salt would do: I made up the recipe on the fly. I mixed a little miso paste into the dashi. Then I chopped some napa cabbage and green onions and put them into a bowl over some cooked udon noodles. I poured the hot miso over everything, then added the mushrooms that had been used to make the broth as well as some sliced fish cake. The result was, well, decent. Not as satisfying as going to the Pink Godzilla and ordering a bowl of udon with tempura, but it tasted okay and was filling. It's high time I got a book on Japanese cooking, considering it's pretty much my favorite kind of food. I know it's probably easier to just go to a restaurant, but there's something really gratifying in being able to recreate the food at home.